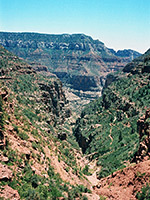 The North Kaibab Trail provides the only maintained route from the North Rim of the Grand Canyon to the Colorado River, although at 14 miles long and with a descent of nearly 6,000 feet, it would take most of the day to hike the all the way, and overnight camping would then be required. Still, it is a lot shorter than the 215 mile journey by road. Because of the high elevation of the north rim, the North Kaibab Trail is only fully open (usually) between mid May and October. 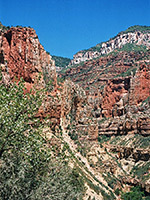 The path is rather longer than the more popular south rim routes as the buttes, peaks and side canyons extend much further north of the river than south, hence the paved entrance road along the flat Kaibab Plateau cannot approach as close - from the north rim visitor center it is over 6 horizontal miles to the Colorado whereas the south rim road is often only 2 miles away. 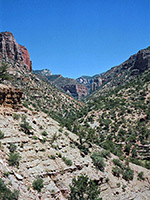 As a consequence, the river only becomes visible near the end of the North Kaibab Trail and most of the views are of Bright Angel Canyon rather than the main gorge but the trip is just as memorable, and rather less traveled. North Kaibab Trail topographic map, North Rim location map. The trailhead is situated beside the main road two miles before the visitor center and has a large parking area with a fresh water supply. This is also the start point for the Uncle Jim and Ken Patrick trails. Adjacent are some stables for the mules which provide an easier but smellier way to descend into the canyon. Due to the elevation of the north rim - 8,300 feet at the start of the path - the immediate area is quite densely forested, and the pine trees persist for some way down, providing welcome shade from the sun. 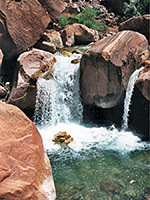 The first five miles are the steepest, descending 3,000 feet along the edge of Roaring Springs Canyon and crossing a seasonal stream several times; the springs themselves do indeed roar and can be heard some distance before they come into view. 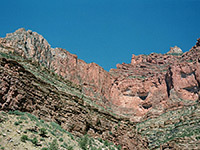 A long section is hollowed out of the vertical cliffs of the Redwall limestone layer, and has sheer drop-offs on one side. 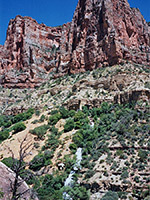 Beneath the springs is a small visitor complex and more stables, now disused (since the mules that once traveled to this point now stop a few miles back at Supai Tunnel), which are reached by a short side-track; this location is the usual destination for an all day round-trip hike. 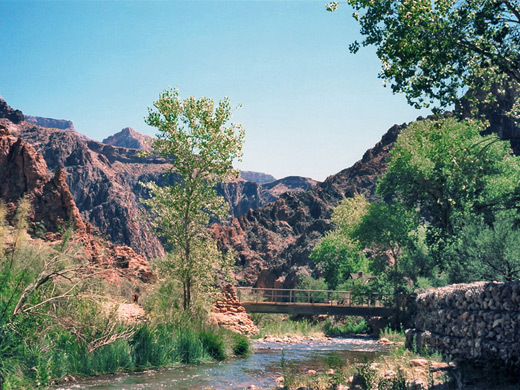 The main trail continues past a private residence with public drinking water (which is also available 3 miles from the start of the trail), as Roaring Springs Canyon meets the much larger Bright Angel Canyon. The path crosses Bright Angel Creek across a small bridge and rounds Manzanita Point after which the inner Colorado gorge - to where the trail leads - can be seen in the distance. 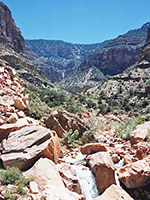 Bright Angel Canyon continues almost straight, descending quite gradually for 7 miles to the river; for overnight hikes, the primitive Cottonwood Campground is located a few miles after the bridge, however places are limited and a (free) permit is required. 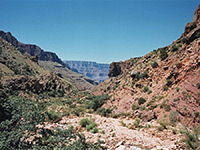 At the river, the path joins the South Kaibab and Bright Angel trails, allowing for a rim-to-rim crossing of the canyon - the record time for the complete trip (21 miles minimum) is apparently under 4 hours although most people attempting the journey camp for at least one night.